The Chicago Blackhawks had a rather unsuccessful 2017-18 season, but the same can’t be said for their American Hockey League affiliate, the Rockford IceHogs. They had a record of 40-28-4 in the regular season and swept the Chicago Wolves and Manitoba Moose in the first two rounds of the Calder Cup Playoffs before falling to the Texas Stars, 4-2, in the third round. Their recent success has caught the attention of many Hawks fans. There are plenty of great prospects on the IceHogs, but some stand out more than others and have a good chance of making the big club next season. Players like John Hayden, Matthew Highmore, and David Kampf will not be mentioned due to their prior experience in the NHL. Although he didn’t score a goal during their playoff run, Louis tallied 14 goals and 30 assists in 70 games during the regular season. Prior to his AHL debut, Blackhawk Up dubbed him as “the team’s most exciting prospect.” He’s well-known for his speed and puck control, two skills that can’t go unnoticed in the ever-changing league. He also uses his small stature (5-foot-7, 151 pounds) to get past larger players. His skills seem to echo the Hawks’ breakout rookie from last season, Alex DeBrincat. There is no word on what his fate is for next season, but there is no doubt he will be seen in a Hawks sweater sooner rather than later. It’s no secret that the Hawks need help on the blue line, and Raddysh could definitely help. The Hawks agreed to terms with him recently, and he should be in the lineup for the 2018-19 season. He recorded five goals and 17 assists in his 66 games with the IceHogs in the 2017-18 season. Prior to signing with the Blackhawks organization, he made a name for himself in the Ontario Hockey League (OHL) by being named the defensive player of the year when he played for the Erie Otters. 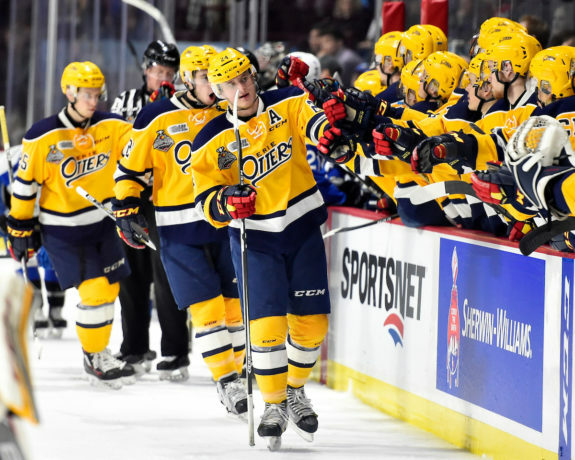 Otters’ defenceman Darren Raddysh (24) leads goal celebration during the semi-final game at the 2017 MasterCard Memorial Cup between the Erie Otters and Saint John Sea Dogs at the WFCU Centre in Windsor, ON on Friday, May 26, 2017. Photo by Aaron Bell/CHL Images. During his time with the Otters, he also showed chemistry with DeBrincat that will hopefully come out on NHL ice. He is also noted to be more of a two-way defenseman, which the Hawks definitely need. Although he made his NHL debut late in the 2017-18 season, he is still considered a prospect. He shined in the 2018 Calder Cup Playoffs as the goaltender for the IceHogs with 10 starts, seven wins, and three losses. The Hawks are in desperate need of a reliable backup goaltender next season, and Delia could be a top candidate. After a hectic 2017-18 season where he played for multiple leagues and teams, Delia is starting to prove himself as an NHL level goaltender. Only time will tell what the Hawks will do in goal, but Delia’s future is looking bright. 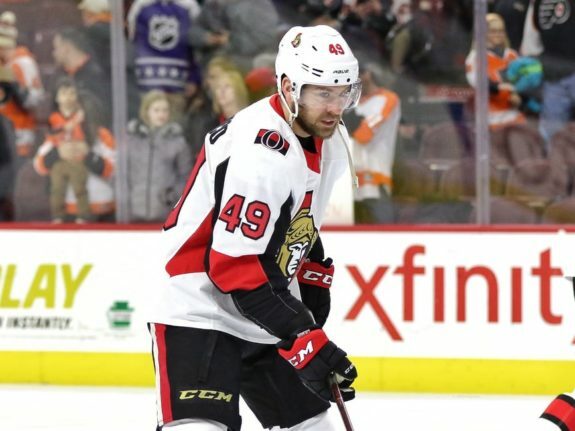 The oldest of the prospects, Chris DiDomenico, played for three different teams this season before arriving in Rockford, including the Ottawa Senators. The IceHogs seems to be where he belongs, where he scored eight goals and 15 assists in 22 games. He led the IceHogs in the playoffs with seven goals and 11 assists in 13 games. DiDomenico has played at the NHL level before and is truly starting to show his potential as an NHL player. Signing him onto the Hawks would be taking a chance, but if he continues on the path he was on during the playoffs, it would be one worth taking. In his 74 games with the IceHogs this season, Tyler Sikura tallied 23 goals and 15 assists in 74 games. He added five goals and one assist during the playoffs. His numbers from this last year and beyond are impressive, and show that he can be a great addition to the Hawks in the future. Prior to his time with the IceHogs, he has played for various AHL teams such as the Springfield Falcons, Portland Pirates, and Iowa Wild. His younger brother, Dylan Sikura, plays for the Hawks and made his NHL debut late in the 2017-18 season.